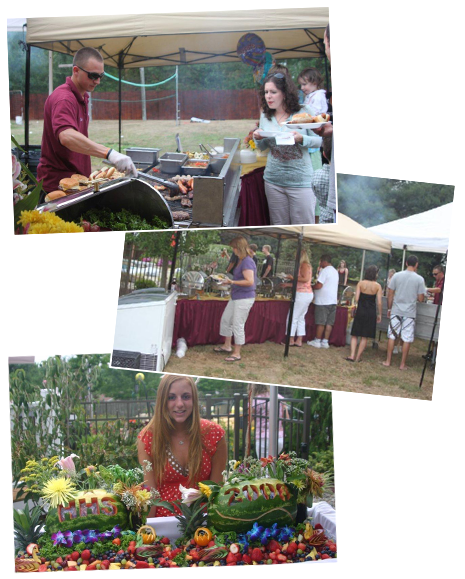 Famous for our fully-staffed summer BBQs and Picnics, Catered Affair will bring our grilling expertise to your backyard or favorite park. We bring the grills, the staff and the best-tasting BBQ food that we are famous for. We can also provide tents, tables, chairs, other rentals, soft drinks, etc., for a complete outdoor party experience depending on your needs. Whether you choose a "Classic BBQ" with Burgers, Hot Dogs and Sausage & Peppers, or an "Ultimate BBQ" featuring such delights as Seafood Kabobs, Steaks, Ribs and more, Catered Affair will bedazzle your crowd with our grilling expertise and friendly service. Considering having a special party or BBQ this summer in Union, Essex, Somerset, Bergen, Middlesex, Hunterdon, Warren, or Monmouth County?..Take a look at our BBQ Menu and give our catering sales staff a call to get your event planned!